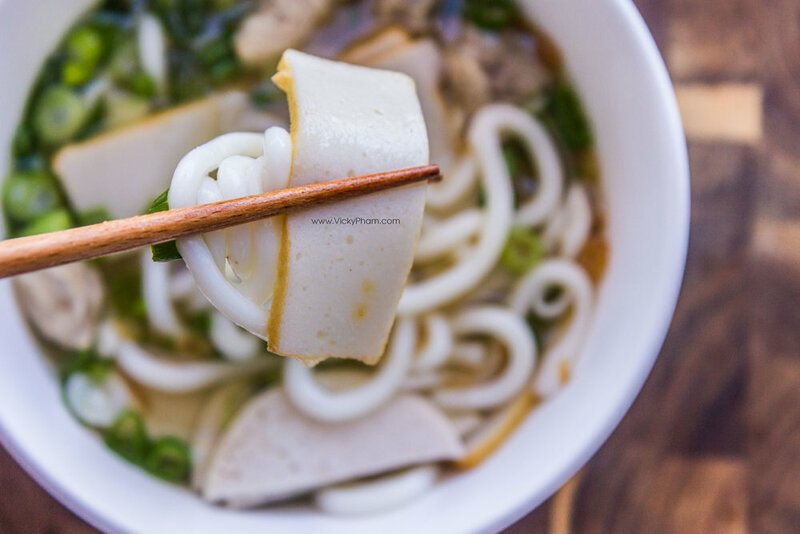 Now that the cold weather is here, a warm bowl of Banh Canh is a must-have! The Banh Canh noodles are thick and chewy, made from tapioca flour or a combination of tapioca flour and rice flour. They resemble Japanese udon noodles and quite often, udon noodles are used as substitute. The broth is made from a pork stock of pigs feet, hocks, knunckles and/or neck bones. The bones are simmered on low for two hours and then seasoned with sugar, salt and pork stock powder. I like the broth on the thicker side so I would cook my noodles directly in the stock pot. The starchy noodles not only absorb the flavorful broth while cooking, but the starch from the noodles also thickens up the broth. I also like to color my broth with annatto seeds. I heat the annatto seeds in vegetable oil to render the color and then add the colored oil to the broth. This is purely optional but the red color adds oomph to an otherwise seemingly plain dish. My husband is not a big fan of this noodle soup because he gets hungry again quickly after a bowl. His dislike for Banh Canh is one reason I make this for dinner whenever he makes me mad. However, lately, he has been asking for this soup. This throws my passive-aggressive-petty revenge out of whack. Bake the onion or shallots in the oven at 350 degrees Fahrenheit for about one hour or when they are soft and oozing. Allow the onions/shallots to cool. Cut into halves and peel. Scrap off all charred areas to prevent browning the broth then set aside. Clean the pork bones thoroughly: Add the pork bones to a large stock pot and fill with water to cover by 1 inch. Add salt (1 teaspoon). Boil the bones for 5 minutes or when you see a lot of foam forming at the top of the water. Drain the content of the pot into a colander and rinse the bones under cold running water. This helps clean the bones, helping us keep the stock clear. It also helps rid of the foul pork smell. Add water (3 liters) to a stock pot and bring to a boil (if you are reusing the same stock pot that was used to blanch the bones, make sure to clean the pot thoroughly before adding water for the stock). Add the blanched bones and onions/shallots. Reduce the heat to your lowest setting and simmer for two hours uncovered. Remove the onions and pork bones from the broth and discard. Sometimes, I leave the bones if they still have a good amount of meat on them. Season the stock. Add pork seasoning powder, sugar, salt (1 tablespoon) and fish sauce. In a small sauce pan, heat vegetable oil on medium high. Add the annatto seeds. Gently shake the pan to help the annatto seeds render the red color (about 30 seconds to 1 minute). Pour the heated oil and annatto seeds into a strainer over the stock pot. Discard the seeds. Cook the Banh Canh noodles per packaged instructions. If the noodles are sticking together, add 1/2 teaspoon vegetable or sesame seed oil and toss the noodles lightly together. To assemble, add a handful of Banh Canh noodles into a bowl. Ladle broth over noodles. Add a few slices of Vietnamese Ham and fried fish cakes. Sprinkle with pepper, scallions and cilantro.